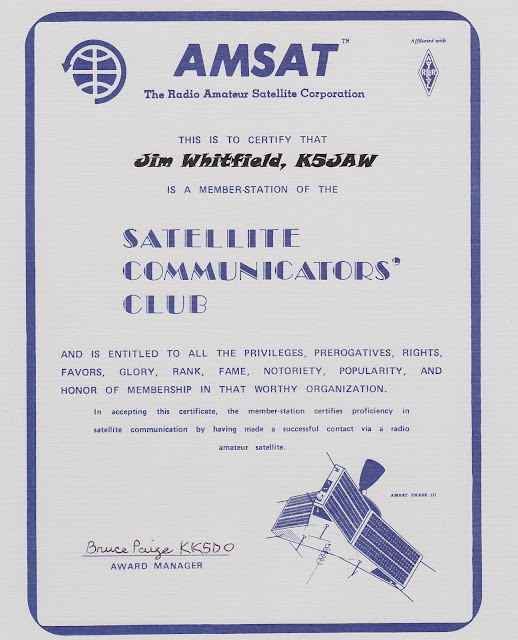 Station K5JAW has joined the ranks of the Satellite Communicators' Club, which is sponsored AMSAT - The Radio Amateur Satellite Corporation. AMSAT is a major sponsor of amateur radio satellite systems that amateur operators use to communicate worldwide. A variety of satellite technologies have orbited the earth in the past few decades, and plans continue to expand the amateur radio satellite constellation. Membership in the Satellite Communicators' Club comes after making radio contacts using amateur radio satellites. Station K5JAW has contacted the International Space Station directly, as well as relayed data to other ground-based amateur stations using amateur radio equipment aboard the ISS.